So, anyone up for moving to a proper template system after 2.1? Maybe Handlebars. Maybe Twig. Maybe Blade... just something that makes it easier for themers to do their thing without having to master PHP. And making it *tons* easier for people to add in snippets of code without breaking things. It's a lot of work. I think it'd be worth it. I was opposing the idea when it first introduced by Suki. I'm still opposing it. I don't think SMF requires any framework inside it apart from (maybe) source framework. I think for next version maybe SMF can introduce something like loadSnip(), which in theory does the same thing. I'm not opposing to frameworks in general, what I'm against is using frameworks in SMF. The uniqueness of the software will blow away with usage of frameworks (my opinion not the fact). If we are starting this, why stop there lets use Laravel (or something) Twig (or something), Bootstrap, Font-Awesome and enhance them with 100% jQuery (no native JS). Awesome, you totally missed the point. None of what I suggested was a *framework*. I was quite careful to be specific - I didn't say Laravel, I said Blade. I didn't say Symfony, I said Twig. I wasn't proposing using a framework, merely using something so that instead of templates being full of PHP, you could give them to themers without them having to learn PHP. Because *that* is what I am proposing. Notice how new people now don't have to figure out quoting syntax. Themers don't have to care about template layers or intermashing into PHP. It's just HTML with some nice placeholders to show them where content goes. Excuse me if I made a mistake in there but I think "twig" is a Template Framework ? (no sarcasm). If I have misknowledge please ignore my comment above. You're way too hung up on what a framework is. A framework is a structure for doing something, nothing more, though often it means a structure for setting up a platform so you don't have to. Twig is not generally considered a 'framework' because it doesn't do anything beyond template processing - it's part of Symfony and Symfony is the underlying framework for everything else. Not that I was evangelising Twig specifically, it was used as an example, in the same way I suggested the Blade part of Laravel. Or Smarty. Or Handlebars. Or Mustache. Or LightnCandy. Or indeed anything that means users don't have to write actual PHP in order to customise it and generally get protected against having to do actual PHP. Twig seems the most interesting out of the three, but... I don't see what difference it makes, you're just switching one syntax for another (which in my opinion is even harder to read when you have so many ifs and etc). Wouldn't you be able to achieve the same thing by just altering the existing php to a different format? Or maybe I'm missing something here. Wouldn't you be able to achieve the same thing by just altering the existing php to a different format? That's exactly what I'm proposing. How many themers have walked away from SMF because they're not really PHP people but can wrangle HTML/CSS just fine? I've spoken to at least a dozen over the years - and I've worked with people who do WP themes, Drupal themes, even Moodle themes. Take it further, this also simplifies matters for modders if implemented correctly because they don't have to wrangle over PHP+HTML syntax nearly so much. Consider also that literally every other forum software does some variation of this process now, except SMF. Because they all recognise that doing it has benefits that SMF's approach does not. They don't all do it the same way, but they do do it. Why? Because it separates viewing logic from underlying logic (good engineering practice), and it allows non-PHP people to modify themes without the hassle. Even WordPress does more like this than SMF does - and SMF isn't trail-blazing a better path here. Its approach was common-sensical and bordering on best practice back in 2003-4. Things have moved on, the industry has figured out better best-practice approaches for application development. SMF templates is a hell for themers. 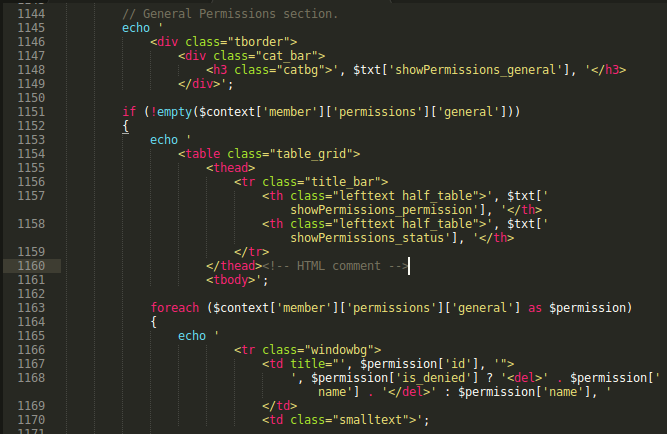 It's a mess of php code and html tags. There is no ability to use any tools or editors to work with this mess. I agree that there is a lot of room for improvement in the templates, some of them are very convoluted. They could do with improvements. What I meant to say is to change how the templates are organized, simplify them using PHP syntax to achieve similar results; a better formatting practice, change the way some of them get things done. The different syntax was not the only change made in your example and I do not think that change alone fixes anything. I do work as a webdeveloper, and the amount of people (even designers) that do amazingly poor (paid) work is incredible. Wordpress is full of them, so it doesn't really help on the case of them knowing what they're up to just because they work on it. It's down to a level I hardly ever accept any job that involves editing existing code, because I'd just be pulling my hairs out wanting to scrap everything and start over. If someone really knows what they are doing, it should not be complicated to edit a piece of HTML or JS inside quotes. To be fair, it does help to have the HTML properly highlighted outside of quotes, that'd be one of the upsides of these systems, but (at least with those three in particular), you're sacrificing the entire PHP readability/syntax just to not have to do echo quotes, and I don't think that is a good trade. That said, there could be a way to get the best out of both worlds out here, I'm not saying we shouldn't look into it. I'm saying I don't see any benefit of these syntaxes in particular, by themselves, unless I'm missing something. Honestly that would be akin to shuffling the deckchairs on the Titanic, it doesn't fix the underlying problem. The different syntax was not the only change made in your example and I do not think that change alone fixes anything. Considering that it was taken from 2.1's index.template.php, flattened and converted to Handlebars, it's completely demonstrates what I'm getting at. It's also not a theoretical example. Let me know when someone invents an editor that can correctly highlight HTML inside a PHP string. I am very skeptic of someone that supposedly knows all about HTML/CSS not being able to do something so simple. Go look at the number of people who tried to add Google Analytics on their site and just copy-pasted the snippet, and see how many of them broke. I do work as a webdeveloper, and the amount of people (even designers) that do amazingly poor (paid) work is incredible. Sturgeon's Law is a thing here too. However, if you make it easier for people to do the right thing, people shockingly tend towards doing the right thing. If someone really knows what they are doing, it should not be complicated to edit a piece of HTML or JS inside quotes. That's the problem. I work with some people who do amazing things with HTML and CSS - but can't write PHP to save their lives and get fed up trying to wrangle it inside PHP. These are the people that can, and do, successfully work with something like these templates but couldn't work with SMF. but (at least with those three in particular), you're sacrificing the entire PHP readability/syntax just to not have to do echo quotes, and I don't think that is a good trade. Ah, so you think that you actually lose something in the translation. You don't. I am currently porting SMF's theme to something like this and other than untangling SMF's convolutions, I have yet to find anything I've actually lost. I have, however, found a number of things I have gained. Oh, and trying to preserve the status quo out of a belief in its current values and assuming everything else is a compromise is just as much an intellectual dishonesty. It's also one of the reasons I quit the team back in 2014 when every 'hey maybe we should do this' always resulted in pointing out the apparent downsides without realising that the downsides don't really exist, don't have to exist or invariably end up better than the situation that is supposedly a compromise. And what exactly in that example requires the different syntax? What in it can't be done using PHP syntax? I'd love that as well, but highlighting open/end quotes of the echo itself work perfectly well for most of them, which is what you mentioned that what I was referring to. And what does that have to do with people who should know HTML? How many of those people actually knew what they were doing? Sure, if you could flip a switch to make echos better and leave everything else the same I'd be all for it, but it isn't this simple. If only heredoc didn't mess up the whole indentation, it would be one way. I'd love to see how their code looks like, doing something that looks nice and it actually being good code are often two very different things. Which means it is still PHP, just using a different syntax. So you could technically change the current templates to use it, and it would still have most of the same problems. Or if that's not how it works, then how does it? Downplaying the downsides just for the sake of change is also intelectually dishonest. Not only that, it's also desperate. Simplifying the system for the sake of lowering the barrier of entry has another name, and it's called "dumbing down". While the problem of overcomplexity you describe is very real, dumbing down the whole system is not the answer. Dumbing down for the sake of a lower barrier of entry does increase activity and diversity on short terms, simply because there are more people working and creating. But it does so at the expense of performance. Dumbing down very quickly develops to slippery slopes of bloat and decreasing quality of output. On long term, it creates situations where you have a bunch of self-proclaimed "mechanics" who don't have any idea how a car actually works. Overcomplexity and lack of organization is a very real issue but I believe there are better ways of solving the issue than taking the low effort shortcut everyone else is taking. The part where you're still mangling stuff in PHP. The whole point is that you *separate away the PHP from actual stuff*. That only gives you the echo. It doesn't give you highlighting of the contents. I *have* highlighted templates. The people that need to know HTML don't need to know PHP as well. Which is great if you happen to be a theme designer. Heredocs give you a different problem. You actually make it worse, not better, because you can't have any inline logic whatsoever in a heredoc. It's simply a string. I can have inline logic if I want, I can have partial templates that embed with no extra effort. Which means it is still PHP, just using a different syntax. Except it isn't. You can't insert PHP into those files and still expect it to work - because it won't. It's physically a separate language that's converted to PHP on demand. Nothing's dumbed down at the level you think it is. I have literally converted most of SMF's templates to use this type of logic already. The generic list was a pain, as was the richtext editor. I haven't quite braved the mess that is the admin settings one yet. And yet it all works and none of it is a problem. And then I can give it to people who don't know what PHP is and let them play with it. Maybe they work with Ruby. Maybe they work with Drupal. Or Moodle. Or any system not this one and can understand how to style it. But it does so at the expense of performance. I believe there are better ways of solving the issue than taking the low effort shortcut everyone else is taking. I'm sorry you feel that way. Have fun. That doesn't explain much... Your example is doing two things, one is that the template was rewritten, and the other is that it is using a different syntax. And you didn't answer my previous question. To be fair, it does help to have the HTML properly highlighted outside of quotes, that'd be one of the upsides of these systems, but (at least with those three in particular), you're sacrificing the entire PHP readability/syntax just to not have to do echo quotes, and I don't think that is a good trade. Sure. And the only relevant thing getting in the way of this is the highlighting, the rest doesn't really make any difference in the end, besides make it worse for those who already know PHP having to learn one more syntax. But god forbid the people editing the HTML learn how the system they are dealing with works. Oh, I see. I kinda skimped over it as the indentation is a dealbreaker over other methods. Still, it would be great if there was something that worked similarly. Note the "with a different syntax". If it merely gets converted into PHP then it really is no different in the way it works, you just write it differently. If there is something else it does besides this, you've yet to say what. I'm not asssuming anything, I'm discussing the issue on its own merits, regardless if it's your problem or somebody else's. You don't seem to understand the issues with not properly lowering the barrier of entry. It's about how it affects the culture around the system after it has been in place, which boggles down to curation, the quality level from the median average output. You lower the barrier of entry, you let the inner workings of the system more distant from the developer. People will develop on top of it without really having the tools for appropriate debugging on the system nor understad its inner workings to properly optimize their work. Like mechanics who don't understand how the car they are working on actually works. You end up with a lot newly developed objects who simply don't fit they system they are working upon. Just look at any mobile app development or the overuse of frameworks to understand what I'm talking about. The same kind of bloated, uneficient coding culture exists around the likes of Wordpress, Shopify, Tumblr, Bootstrap etc. Lots of sleek modern themes, none of them runs well. "[...] there could be a way to get the best out of both worlds out here, I'm not saying we shouldn't look into it. I'm saying I don't see any benefit of these syntaxes in particular, by themselves [...]"
Now, rewriting the templates, by all that has been said so far, is a separate matter, and surely one that can be addressed independently from the syntax used. I like the idea of using a proper templating engine for SMF themes. Rather than write one from scratch, using a popular library means that the work is offloaded a bit. I'm a fan of Twig personally, but any sane thing would be great. (Note that Smarty is not sane.) Don't think of it as "still PHP" because it's not. It's more a Domain-specific language (https://en.wikipedia.org/wiki/Domain-specific_language) just for templating. As a bonus, that means you don't need to be a PHP master to create or modify a design. This is a huge benefit as it means that core developers don't need to waste time helping a design-focused contributor on making changes. For the most part, you can even load the raw template in the browser and since you don't have a ton of PHP in it, but rather placeholder tags, it will display fine without needing a whole SMF install. When you're focused solely on design, does it matter to know that you're having a plain PHP echo, or just to know that certain text goes in a place? I'd argue that anyone focused on design would be happy to not have to remember a bunch of PHP echo quoting rules and would rather just have a placeholder they knew would contain some text. Well, there is the short open tags option, but that often isn't enabled and can interfere with other legitimate tag usage. Most of the templating languages like Twig and handlebars are pretty quick to pick up. Also, if you're worried about having to learn multiple languages why are you not concerned about PHP coders having to learn CSS and JS? Templating engines like Twig are the answer. No worrying about jumping in and out of logic code. No worrying about proper escaping syntax. Just write my HTML, stick in the placeholder tags and go. Well, it's PHP internally. It's not like it's pre-processed into PHP that you'd work on or anything (well, kinda, but that's not relevant for this discussion). The something else it does is cleanly separate the controller logic from the view. It makes both parts easier to code and read. As for "appropriate debugging", if the template is cleanly separated, there shouldn't be any fancy tools needed for that. It should work just fine as all you're doing is creating a design and dropping placeholders into the appropriate areas. There shouldn't be any optimzation needed on the logic side, that's all handled by the SMF PHP that shouldn't need to be touched. As the one championing the idea yes, I'm very much in favor of using a proper template system. Over the years I tried a few different aproaches, from XML based (FatFree, dunno the name of the template engine), quasi raw php (lithium, again dunno whats the name of the engine) to twig and blade. I'll be more inclined for either twig or blade, followed by the xml structure fatfree provides which takes time to get used to but its surprisingly easy after you get over the learning curve. On the other hand I rather prefer to stay away from engines that uses raw php (ala codeigniter) or an even weirder way to use php opening tags as token separators (lithium). In fact, I have a bunch of other ideas, dunno where to post them or if I will have the time to do a proper post for each but I would like to at least express them to see if theres enough interest. Agreed on using something like twig or blade. Not sure I'd want something so different that there's an odd learning curve. BTW, it looks like Lithium is now named li₃ (or li3). Yeah, I love fatfree and its template engine but its heavily geared towards developers and thus, it wouldn't fit with SMF's current needs. Although Laravel has gained a lot of popularity these past couple of years I would prefer Twig solely because its more recognized by designers. I don't know if blade has been used outside Laravel projects. Didn't had the chance of reading previous entries. About "dumbing down". This is actually something a few very vocal SMF themers have always ranted about. How SMF is all backend no frontend and things like that. If using a proper template engine doesn't make them happy, nothing will. I personally don't see it as "dumbing down" or simplifying. I see it strictly as separation of concerns. This has nothing to do with "lowering the barrier" or other similar thoughts, it has to do with keeping logic away from presentation and viceversa. Both front and back are equally important, separating them allows us to give them both enough care and focus. These days the "performance" card cannot really be used anymore. PHP 7.0 improvements over 5.0 says so categorically. Besides, any good template engine parses templates and store them as raw php file, meaning theres really no difference between a parsed, cached twig/blade template and current SMF template files except when the parsed template is been generated and lets be honest, how many times will you do that on a production enviroment. That doesn't mean we shouldn't keep an eye on how those templates are parsed and rendered but its not something crucial to the overall performance of a forum page. This goes beyond all of that. WE are talking about the next mayor SMF version. we are talking about 10, 20 years into the future. needs planning, serious planning. Needs vision, needs doing actual software architecture (https://en.wikipedia.org/wiki/Software_architecture). * slippery slope: layers of abstraction. Yes, as a general rule fewer layers of abstraction make it faster, but the opposite argument stands: if performance is a consideration, maybe Asm32 (https://asm32.info/fossil/repo/asmbb/index) should be the platform of choice. Ditto for customisation - after all, there's absolutely no levels of abstraction involved there, you have the power to literally do anything the machine can do. Except this is also a slippery slope in itself, elitist yada yada yada. Yes, that is nothing I disagree on, but this again goes back to the example I gave here (https://www.simplemachines.org/community/index.php?topic=556516.msg3944785#msg3944785), you don't need to use one of these templating engines to fix that. I'm all for improving admins customizations features, but it should not do so at the expense of developer tools, they're different things. Of course if we took this further I very much like the way Vue (https://vuejs.org) is heading.